This holiday season, give your family the gift of home-cooked meals that combine the flavor, comfort and variety of dairy. Dairy foods, such as milk, cheese and yogurt, can serve as helpful on-hand ingredients that also provide nutritional and economic value to help you eat, drink and be merry. Start those busy shopping days off with a hearty bowl of oatmeal made with milk. For lunchtime get-togethers, give tuna or chicken salad extra zip by replacing mayo with plain yogurt. Make side dishes sparkle by sprinkling shredded cheese on steamed vegetables before serving for added flavor. Warm up everyday cold weather favorites by switching out water for milk in hot chocolate, soups and even bread dough and other baked goods. Get a kick start on those New Year’s resolutions by using protein-packed plain Greek yogurt to top baked potatoes, chili and soup, and as a base for homemade dressings. For extra flavor and nutrition, top seasonal favorite casseroles and pasta dishes with shredded cheese. For last-minute parties, mix plain yogurt with seasoning or mash with an avocado to create a quick dip. Serve delicious, one-dish dairy-inspired dinners, such as dairy farmer Chris Sukalski’s Parmesan Chicken Fettuccine. Find more information, nutrition tips and recipes at MidwestDairy.com and visit Midwest Dairy on Pinterest for more dairy-inspired holiday ideas, from home-cooked meals to party pleasing recipes and holiday gift ideas, such as The Dairy Good Cookbook. Cook fettuccine according to package directions, adding broccoli during last 3 minutes; drain and keep warm. Meanwhile in large skillet, melt 2 tablespoons of butter over medium heat. Season chicken with 1/2 teaspoon salt and 1/4 teaspoon ground pepper. Cook in hot butter until cooked through, 5-6 minutes. With slotted spoon, transfer chicken from skillet to a plate; set aside. Add 2 tablespoons butter to skillet. Cook onion, garlic and mushrooms in hot butter until vegetables soften, 4-5 minutes. Set aside. In medium saucepan, combine remaining butter and heavy cream over medium-low heat. Heat and stir until butter is melted, about 2 minutes. Stir in remaining salt and remaining ground pepper. Add Parmesan cheese and stir until melted. Stir in chicken, onion mixture and half the bacon. 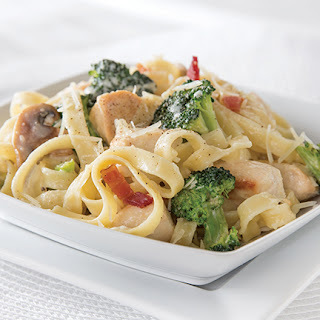 Toss drained pasta and broccoli with chicken mixture. Divide among 6 serving plates. Top with additional grated Parmesan, remaining bacon and cracked pepper.